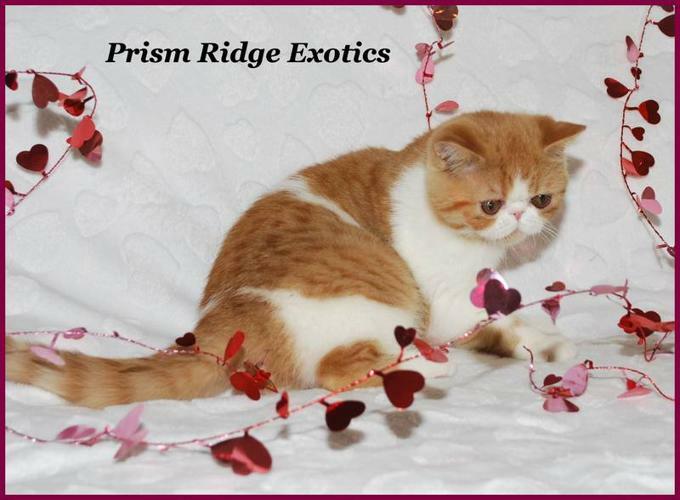 REGISTERED RED SPOTTED TABBY & WHITE - EXOTIC SH (SHORT HAIRED PERSIAN) - FEMALE - KITTEN AVAILABLE. EXOTICS HAVE THE SAME SWEET TEMPERAMENT AS THEIR PERSIAN COUSIN. THESE FUN LOVING CATS MAKE A GREAT FAMILY ADDITION. THIS GIRL HAS A SWEET EXPRESSION WITH NICE ROUND EYES. SHE HAS BEEN VET CHECKED AND VACCINATED X 3. SHE WILL BE SOLD WITH CONTRACT THAT INCLUDES A HEALTH GUARANTEE. ALSO INCLUDED IS A ROYAL CANIN KITTEN STARTER PACK. OR INSERT 563CINDERELLA INTO THE YOUTUBE SEARCH AND SEE ALL VIDEOS! SHE IS READY TO GO!!! PLEASE PROVIDE A SHORT INTRODUCTION OF YOURSELF THAT INCLUDES WHERE YOU LIVE AND IF YOU HAVE OTHER PETS.